For the purpose of the IEC Analytics Reconnoiter project I have been trying out ways of explaining the domain in ways that are readily understood by non-technical colleagues new to the ideas and staying clear of the different technical solutions that might need to be deployed. A key distinction here is that Educational Data Analytics takes a wider view than Learning Analytics using data about the the University as an enterprise. The diagram below is based on two key dimensions that stand out for me based on readings, namely the time of use from collection dimension and a control and authority dimension (reminiscent to me of the Edinburgh Scenarios, Jonathan Star 2004). 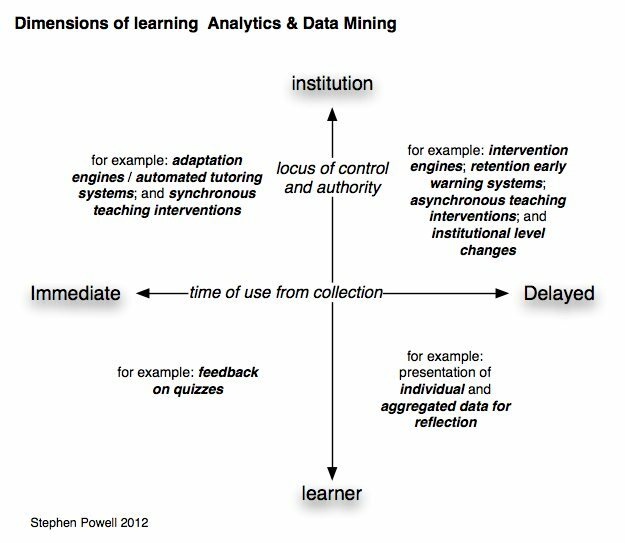 I think that a key point is to get across the potential in the top right hand quadrant and what it might mean for understanding the University as an enterprise (Educational Data Analytics ) beyond learning analytics and data mining that focus on pedagogical, learning and teaching aspects. learners: self reflection, cohort comparisons, automated learning, etc. • teachers: retention, progression, student satisfaction/experience, etc. • course developers: design for success – assessment, content, teaching strategies, etc. • administrators: retention, progression, efficiencies, balancing HEFCE control numbers internally, etc. • researchers: pedagogy, models, theory, etc. • long term for researchers & courses developers – the concern of theses groups tend to be more about aggregations of experience over a number of iterations. An untidy thread that is niggling me and perhaps just needs more reading around is where Management Information Systems fit in all of this – they have been around for a very long time now and seem to occupy most of the Educational Data Analytics domain. This entry was posted in Learning thoughts on April 17, 2012 by Stephen Powell.